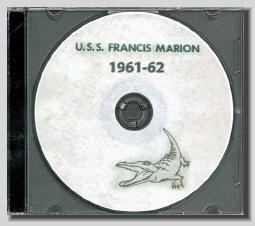 You would be purchasing the USS Francis Marion APA 249 cruise book during this time of peace. Each page has been placed on a CD for years of enjoyable computer viewing. The CD comes in a plastic sleeve with a custom label. Every page has been enhanced and is readable. Rare cruise books like this sell for a hundred dollars or more when buying the actual hard copy if you can find one for sale. Ports of call: <?xml:namespace prefix = "st1" ns = "urn:schemas-microsoft-com:office:smarttags" />Galveston, Guantanamo Bay, Charleston,San Juan, St Thomas, St Croix, Hamilton, Martinique, Trinidad, Curacao and the Dominican Republic. Over 338 pictures and the Ships story told on 79 pages. Once you view this CD you will know what life was like on this Transport during this period of time.